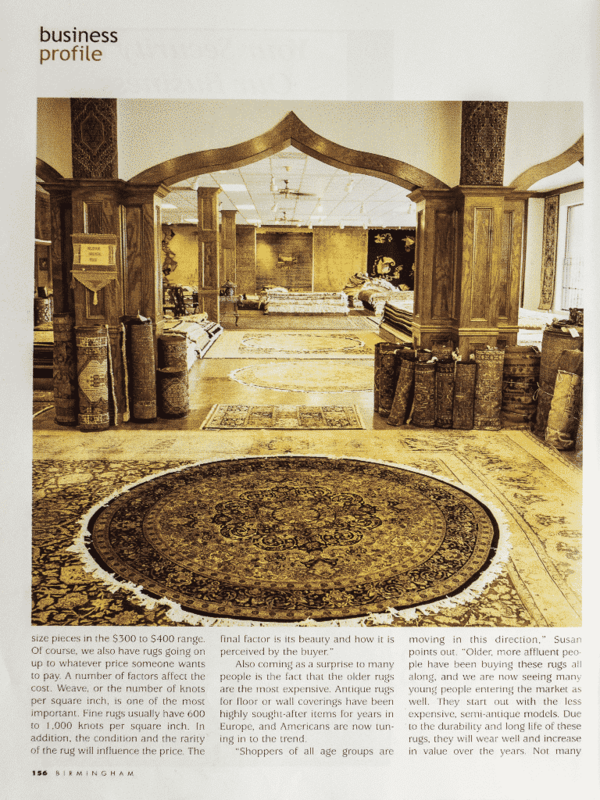 Hossein Nilipour had something very specific in mind when he built his Oriental rug store in Homewood: Make customers feel as though they are in the middle of a Middle Eastern market. Ornate, curved archways frame the thousands of rugs from Iran, Pakistan, India and China that splash color on the floors and walls of Nilipour Oriental Rugs Inc.
Rugs heavy in their rich colors and exotic designs, and those lighter in color with more delicate designs, hang from the walls and are piled on the floor. Nilipour speaks about how they are made carefully, and painstakingly, by hand as they have been for centuries, and how you can identify the region or city they are from by the decorative patterns, colors and materials used. "They are like beautiful works of art," he says. They are also his business. 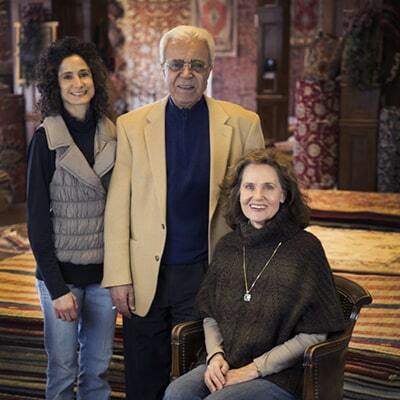 Nilipour first began selling Oriental rugs in Birmingham 31 years ago, from a small store on Reese Street. He moved to his current 13,000-square-foot location, his third, in 1987. Today, he has customers throughout the South and is thought to be the only direct importer of Oriental rugs in Alabama, which he says enables him to keep his prices lower than competitors. He has a store in Washington, D.C., that he runs with a cousin, and is still somewhat involved in the family's Oriental rug business in Isfahan, Iran, where he got his start. 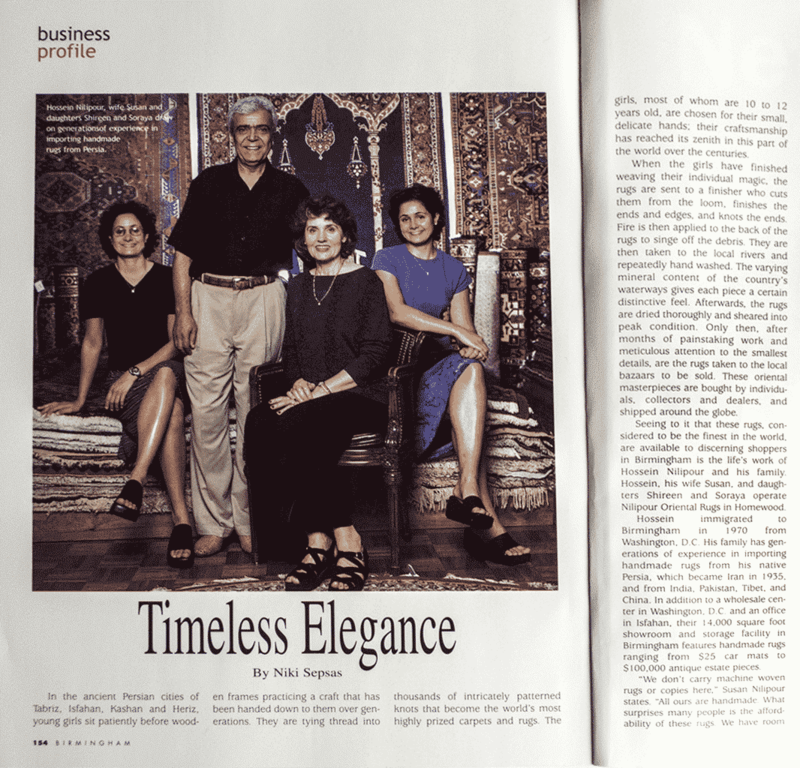 Nilipour won't reveal his company's annual revenue but says his business has grown, albeit gradually, each year over the past three decades. No dramatic increases, but no downs; just slow, steady growth, he says. Even the 13-year-old U.S. embargo against Iran, where Persian rugs are made, didn't slow business. 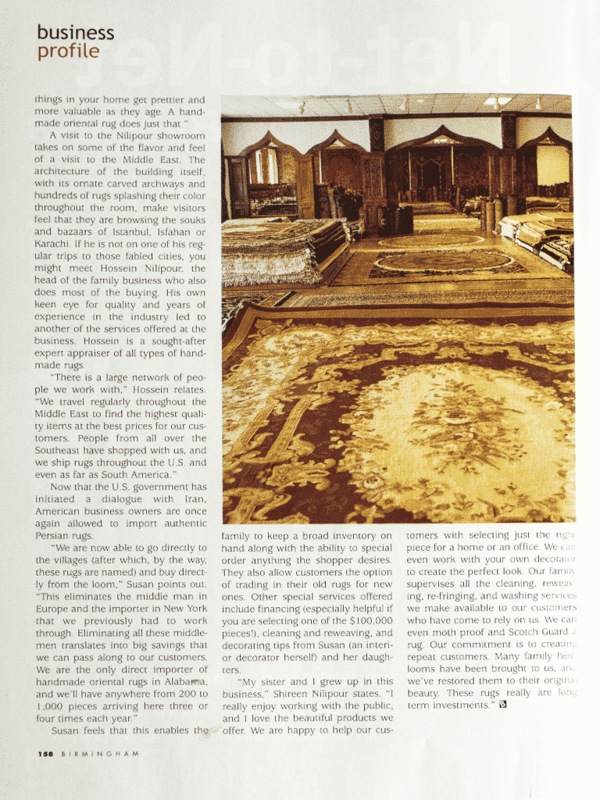 Nilipour says he was still able to get Persian rugs, considered the cornerstone of the Oriental rug industry and most of what Nilipour sells, because there was enough supply among dealers in this country. He also says many weavers had moved to Pakistan and India during the revolution in Iran and were making Persian rugs there. And, the outlook for the industry is strong, given the embargo's lifting in 2000 and the growing popularity of hard-surface floorings, such as ceramic tile and hardwood, according to the Oriental Rug Importers Association. The Secaucus, N.J.-based group says U.S. imports of Oriental rugs totaled $1.5 billion in 2000, the latest year for which statistics are available. That's up from $1.3 billion in 1999, $1.1 billion in 1998, $1 billion in 1997 and $880 million in 1996. Nilipour says he's had offers from investors to expand, but prefers to remain in Birmingham to sell and share his knowledge about Oriental rugs. "If you don't find what you want, we'll give you a cup of tea and that's fine," he says. Nilipour came here from Iran in 1970 to attend the University of Alabama at Birmingham. He was a full-time student for a year or so, but missed being around and selling Oriental rugs, which he had done with his father in the family business before coming to the United States. So, Nilipour began taking classes at night and by day sold rugs. He started small. His father sent him rugs directly, eliminating middlemen and importers. 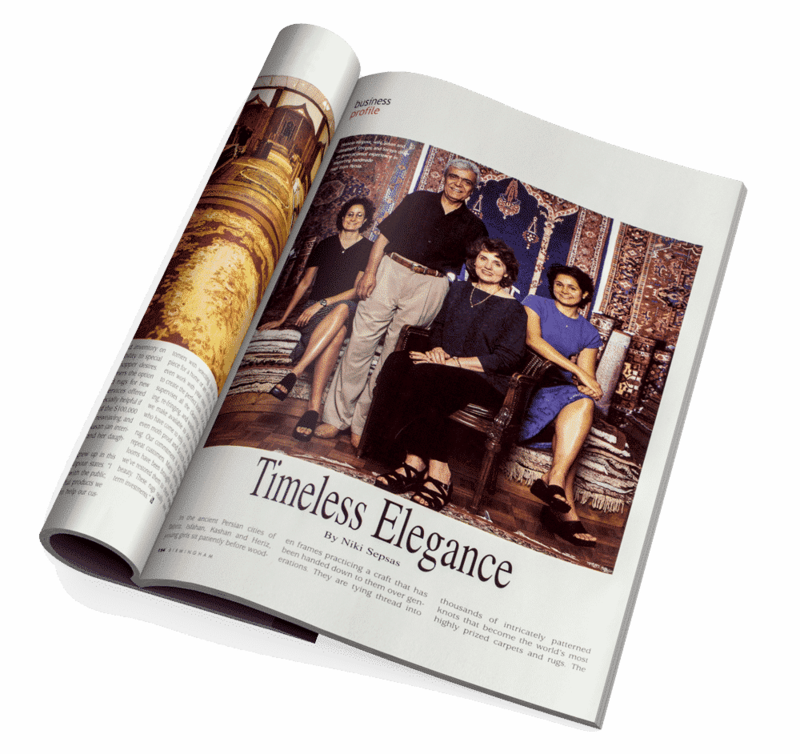 His first clients were contacts his wife, an interior designer, made through her work. "They started coming to my shop and I ordered what they wanted," he says. Nilipour graduated, his wife joined him in the business and they soon moved the store to a bigger location on 18th Street, where he remained for 15 years before moving to his current location, also on 18th Street. Nilipour Oriental Rugs also provides cleaning, repair and reweaving, financing and appraisal services - and accepts trade-ins. "When you buy a rug from us, if you move and the rug is too big or too small or the wrong color, you can trade it in for another rug," he says. Trade-in policies are the mark of an established, reputable dealer, says the Oriental Rug Importers Association. Technology has eliminated the need for Nilipour to make a lot of overseas buying trips, but he still travels home several times a year. He also orders what he needs from rug makers by phone or via the Internet. The manufacture of Oriental rugs, however, is anything but high-tech. They are made by hand on wooden frames, usually in people's homes and usually by women practicing a craft handed down for hundreds of years. Most Oriental rugs are made from wool spun into yarn by hand and dyed with natural substances. Blue comes from indigo plants, gray and brown from nutshells and oak-bark, yellow from the dried pistils of the saffron crocus and red from the roots of the madder plant, a wild perennial. Weavers have drawings by their side to go by as they knot the yarn onto the wool foundation on the loom. The rugs have anywhere from 600 to 1,000 knots per square inch. Nilipour says a 9-by-12-foot Persian Rug can take several workers several years to make. And while it might fetch a price of $15,000, that's reasonable, he says, considering the time, craftsmanship and artistry involved in its making. "You have to look at it as a piece of art, not just a floor covering," he says. 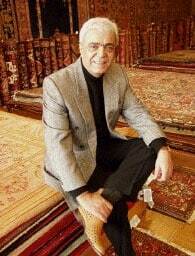 Nilipour's rugs range in price from $25 car mats to $100,000 antique Oriental rugs. He says customers also can purchase a nice, room-size Oriental rug for $1,500. He says Oriental rugs are durable and hold their value. Long-time Nilipour customer Sallie Davidson, owner of Davidson Interiors in Tuscaloosa, says Nilipour's rugs are of the highest quality, and the store has a large selection to choose from, both new and antique. She says while she buys from other dealers in a few other states, Nilipour is the only one she works with in Birmingham. "He fits the niche I'm looking for," Davidson says. Contact reporter Leslie Zganjar at (205) 443-5631 or lzganjar@bizjournals.com. See us in Birmingham Magazine!